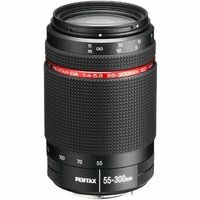 The Pentax 55-300mm f4-5.8 ED WR DA Lens Black is a versatile, weather resistant telephoto K-mount zoom lens covering an extensive focal length from 84.5mm to 460mm (in the 35mm format). The lens features high definition coating two ED (extra-low Dispersion) glass elements in its optics to minimise chromatic aberrations throughout the entire zoom range and deliver sharp images with a high-level of contrast and detail. The solid, weather resistant construction ensures a reliable performance in all-weather conditions and provides the user with peace of mind. This 5.5x zoom lens is suitable for a wide variety of applications and subjects including wildlife, sports and portraits.